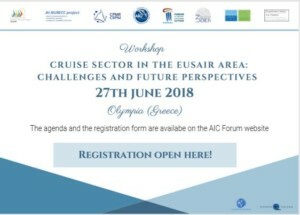 The Forum of the Adriatic and Ionian Chambers of Commerce is organizing the event “Cruise sector in the EUSAIR Area: challenges and future perspectives” which will take place on 27th of June in Olympia (Greece) at the SPAP Conference and Exhibition Centre. In the Greek city the macroregional stakeholders will have the opportunity to discuss on how to the strength the cooperation in this specific dynamic touristic sector. This is the first event of AI-NURECC, an initiative promoted by 5 networks which have decided to join their efforts aiming at supporting the EUSAIR implementation. The lead partner of AI-NURECC is the Conference of Peripheral Maritime Regions – CPMR. Other partners, beside the Adriatic Ionian Euroregion are: the Forum of Adriatic and Ionian Cities, the Forum of Adriatic and Ionian Universities – UniAdrion and the Forum of the Adriatic and Ionian Chambers of Commerce.